Good Sunday to all of out there. I got this really cool "Friendship" Meme from Nelle of Lucid Creativity. My little girl loves Pooh, Tigger and the rest of the 100 Acre Woods gang. Remember this picture I posted a few days ago? 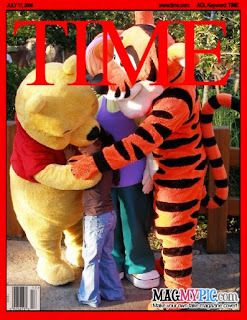 Yep, that's her sandwiched between Pooh and Tigger with Darvy looking in. Anyway, thanks Nelle for this nice tag. Good to have come across your blog. Anger is only one letter short of dangerIf someone betrays you once, it is his fault;If he betrays you twice, it is your fault.Great minds discuss ideas;Average minds discuss events;Small minds discuss people.He, who loses money, loses much;He, who loses a friend, loses much more;He, who loses faith, loses all.Beautiful young people are accidents of nature,But beautiful old people are works of art.Learn from the mistakes of othersYou can't live long enough to make them all yourself.Friends, you and me...You brought another friend...And then there were 3...We started our group...Our circle of friends...And like that circle...There is no beginning or end...Yesterday is history.Tomorrow is mystery.Today is a gift.So now, let's see how many circle's of friends we can make by simply adding your link on this Friendship Meme! Let me tag the Mamas because I'm sure their little ones also love these 2: Mommy Nanz, Mommy Emma, Mommy Dauphine, Mommy Recel, Mommy Ritchell, Mommy Vicky and Mommy In-in.